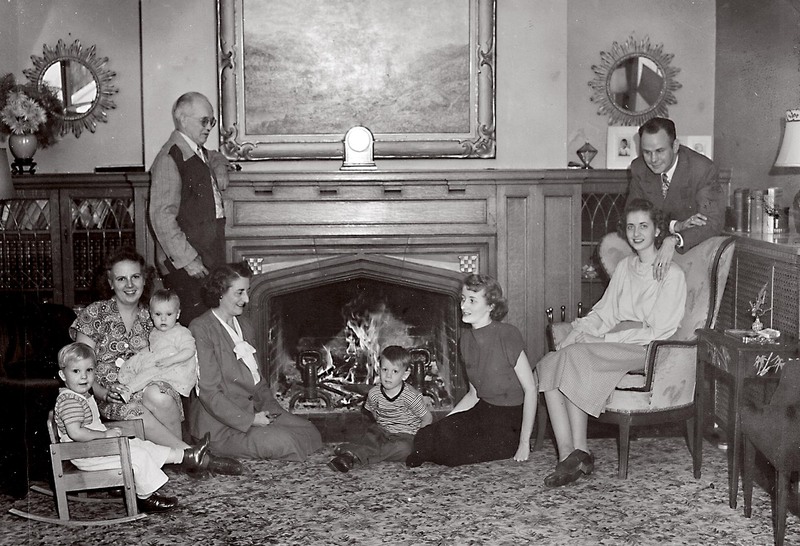 Above, Newlyweds Charles and Diana Vogel (right) in 1949, in the Attlesey family home. Photo courtesy of the Vogel Family Archives. There are other Charles and Dianas in the world, even some we have all heard about, like those in the British Royal Family. But this story is about everyday people, and a loving marriage that stood the test of time. Charles Richard Vogel was born on December 8, 1919 in St. Louis. His mother, Anna, was a seamstress and his father, Charles Sr., worked in a glass factory. Both parents came from families that had emigrated from Germany in the nineteenth century. When Charles was 5 years old, his father died of tuberculosis. In those days, before modern antibiotics, TB took a terrible toll, especially among younger people aged 15 to 45. Also called Consumption, the disease weakened the body so much that many patients looked gaunt and skeletal. Later on, Anna remarried to a man who worked as an oiler for the railroad. But her new husband had been “shell-shocked” during World War I, something we now call PTSD or post-traumatic stress disorder. He became abusive, and the marriage didn’t last. Young Charles and Anna moved back to be near family in Washington state, her original home. For a while they stayed near where her father and mother were working at a lumber camp and sawmill near North Bend. Her mother was a cook at the camp. 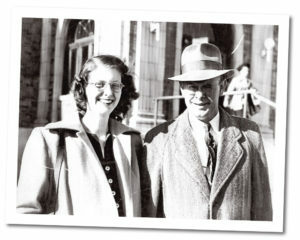 Anna later moved to Seattle with her son, where she met George Hertel, Sr. in 1934. They married and eventually bought 5 acres out south of Seattle near Highway 99 where George raised chickens and commuted to work at Frye Meat Packing Co. on Airport Way. They had a son, George Jr. in 1935 who was half-brother to Charles. Charles attended Franklin High School in Seattle, and after graduating, he joined the CCC (Civilian Conservation Corps) for a time. Anna thought it would be good for her tall, skinny, studious boy to work in the outdoors. The CCC was a New Deal program in the late 1930s that created jobs for young men, age 17 to 28, nationwide. They constructed and upgraded more than 800 parks, and the CCC also helped rehabilitate damaged land. Of the $30 monthly pay awarded each crewmember, $25 typically went home to parents and families while their sons lived in makeshift camps in the wild. Charles went to work at Millersylvania State Park near Tenino, Washington, as well as at Olympic National Park near Lake Quinault. Charles and Diana both attended Franklin High School. Charles was in the class of ‘38, and Diana, who may have graduated from Broadway High School, was in the class of ‘46. Photo courtesy of the Vogel Family Archives. 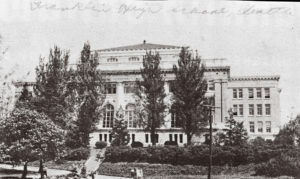 While at Franklin High, Charles became a friend of Betty Attlesey, the daughter of a pharmacist who ran a drug store at Rainier and Othello. Betty had a younger sister, Diana. Diana May Attlesey was born December 3, 1928. She grew up in Seattle, and attended Franklin, and also worked as a soda jerk after school in her dad’s drug store. Her first car was a beloved Model A Ford. Charles first met Diana during a family event for Betty in 1942 when Diana was 14 years old. The event was at the new Attlesey residence on West Mercer Way, on Mercer Island, in a small community known as East Seattle, which included many summer homes. The new Floating Bridge had opened in July, 1940, and so Mercer Island and Seattle were now connected for the first time. 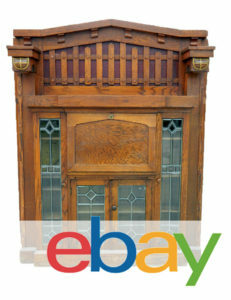 Diana’s father Herb and mother, Myrtle, found a big, old stone house for sale that had fallen into disrepair, and had also fallen into the ownership of a church after the original owners had departed during the Great Depression. Charles made note of Diana, the younger sister, but World War II had just begun. The 5-acre plot near Bow Lake where Charles and his family now lived was needed for the war effort. In early 1942 the Army Air Force took control of the airport at Bow Lake in order to expand it. The Port of Seattle approved the Bow Lake site (now Seattle Tacoma International Airport) and paid $637,019 to acquire the property from 264 different owners. George Sr, Anna, Charles and George Jr, moved briefly to Vashon Island where George Sr. died of a heart attack in November, 1942 at the age of 48. The family moved to Poulsbo where Charles worked at Keyport building torpedoes until he was drafted into the Army. Anna worked as a “powder girl,” installing gunpowder into torpedoes. After boot camp, Charles worked as a Quartermaster, which was the Army supply division. Anna remembered that his letters home always had snippets removed by Army censors, lest any innocent military details be intercepted by the enemy. 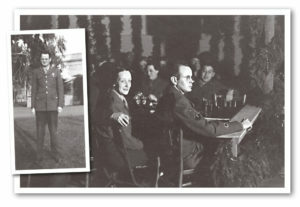 Charles Vogel (right) on Christmas night, 1945 at UNRRA headquarters in Pasing, Germany. Inset photo: Charles in uniform, serving during WWII. Photos courtesy of the Vogel Family Archives. Charles served in France after D-day, and later, in the Battle of the Bulge. On December 16, 1944 in the densely forested Ardennes mountains near the Belgian border with Germany, the German Army attacked. They were able to maintain nearly complete surprise during heavy winter weather against a weakly-defended sector of the Allied lines while the storm grounded the Allies’ superior air forces. American casualties totaled 89,000, including 19,000 killed before the Allies prevailed by the end of January, 1945. In the bitter snow around Christmas, 1944, Charles hid in a box-car on a rail siding while German soldiers overtook the units’ supply location. He had been ordered to destroy supplies ahead of time so they would not fall into enemy hands. He recalled the acrid smell of burning sugar long afterwards. After the German surrender at the end of April, 1945, Charles was assigned to the newly created UNRRA (United Nations Relief and Rehabilitation Administration), headquartered at Pasing, Germany. Such organizations were set up to assist the military with the job of stabilizing the German population, which was starving amid almost complete destruction and chaos at the end of the war. Charles Vogel came home from Munich at age 26 on July 5, 1946 and tried to see what the future would hold. He enrolled at Auerswald Business College in Seattle taking night classes in accounting while working for the post office during the day. A war-time leg injury kept him in the sorting room instead of out delivering mail. Charles and George lived with Anna at a boarding house she bought at the top of Beacon Hill. Diana Vogel and her brother-in-law George Hertel, Jr. dance on New Year’s Eve, 1957. Charles Vogel is behind the camera. Photos courtesy of the Hertel Family Archives. Since the mid-1930s, Charles had subscribed to Time Magazine, which reported the news of the world week by week. He was interested in history, and he kept them all, even through the CCC and war years. He also avidly collected stamps, mostly US and first-day-covers, and he would sometimes leave a number of envelopes soaking in the bathtub to loosen the cancelled stamps. He called up his friend Betty Attlesey and they went on a few dates, but it was a platonic relationship. The Attleseys still lived on West Mercer Way, and one day Charles chatted on the phone with Diana who was now a lovely 18 year old. Diana finally said: “Didn’t you call to talk to Betty?” and Charles replied: “No, I called to talk to you. Would you like to go out with me?” The two hit it off right away. Eventually Charles asked Diana to be his bride. They were married July 23, 1949, at Mercer Island Lutheran Church in a double ceremony with sister Betty and Warren Roundhill, a young Boeing engineer. As a wedding present, Diana’s parents gave them a hillside building lot up behind the big house in the woods with a view of Lake Washington. Charles and Diana began married life living with Anna and George on Beacon Hill in an upstairs room. They decided to start a family soon after and the first of their three daughters was born in November, 1950. (In fact all three children were born in different years, within about one week of each other in November, nine months after Valentines Day, evidently their parents’ favorite holiday). They broke ground for their house on the hillside on Mercer Island in 1951, adding to it as money became available. Charles traveled and wrote love letters home to Diana. He worked as a Credit Union Examiner for the federal government, and then later for the State of Washington Division of Savings and Loan, examining State credit unions. His experience and accounting background led him to start his own business in 1959, managing small credit unions that at the time, had no paid staff or full-time locations, but were largely run by volunteers. In the early 1960s, Charles and Diana bought land on the east side of Airport Way, south of Holgate street in the heart of the industrial area were many companies had small credit unions started by employees. At first, Charles ran the business out of a trailer attached to an old gas station building that was on the property. Charles and Diana Vogel in Washington, DC in the early 1950s. Photo courtesy of the Vogel Family Archives. For relaxation the family took summer vacations, many times hauling a trailer, and Charles was able to perfect his other favorite hobby of taking home-movies of his family which now included 3 girls. Their house on the hill now had a second story, and Anna had since moved into the first floor in 1965. For a change, everything seemed to be perfect. Just as Charles and Diana were making plans for a permanent credit union building on the Airport Way property, Charles was diagnosed with Leukemia. Bone marrow transplants were newly available, and he was on a waiting list for a future transplant. Unfortunately, while being treated for the disease, he contracted Hong Kong flu. Three weeks later, Charles died of pneumonia, on February 15, 1970. It was the day after Valentines Day. He was 50 years old. Diana continues to live today in the home they built on Mercer Island, on the land given to them by her parents. She never remarried.